An article in last week’s Sunday New York Times, says that never since the Great Recession of the 1930s have so many Americans started businesses (565,000 of them a month in 2010) than at any period in the last decade and a half! Technology that diminishes the dimensions of time and space… and favors small businesses… especially the internet, has made it more possible than ever before for individuals to follow their dreams with their own global micro business. Now expanding your own business becomes easier with our International Micro Business Fair Advertising that reaches our 27,000 + reader list. Our latest advertiser for Ecuador real estate sent this note yesterday: Gary and Merri, Your ad opened Tuesday August 16th. I had an overwhelming response and sold the first unit Friday August 19th. Thanks for the great job and great website. Regards, John Fisher. You can see this ad here. Ecuador real estate ads is a way we have been helping our Ecuadorian readers. The success of these ads has led to a new International Micro Business Fair Advertising program. www.EcuadorLiving.com and www.Garyascott.com have a combined and growing list of readers nearing 30,000. You can reach our readers with offers to sell or distribute or buy your product. Many of these readers share three things in common. #1: They have moved or are planning to move from their homeland and need something to do in their new residence. #2: They need extra income. #3: They have income and/or savings and capital. You can show these readers how to earn with your product from an affiliate, distributorship or wholesale plan with an International Micro Business Fair Ad. If you have a business or product that you wish to expand with our readers who are looking for business opportunities, place an International Micro Business Fair Ad. When you sign up for an ad, I’ll build a post in WordPress… send you a sample for approval in a Word .doc file and upon your approval post it at our site. Our autoresponder systerm will send the post to both our main lists… plus your ad will be placed and remain in our monthly Funky Business Hall of Fame until you tell us to pull the ad. Often the post will get a good Google ranking for you. 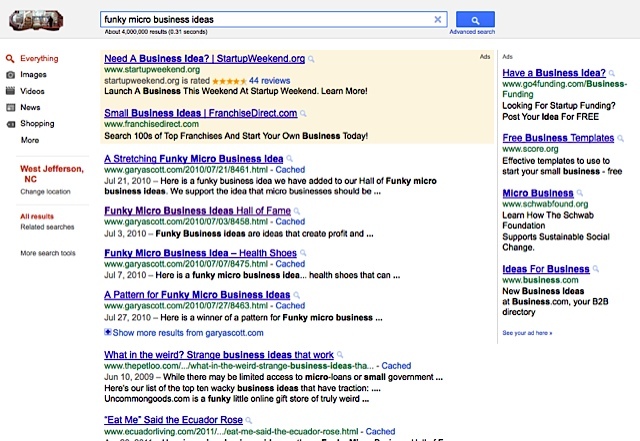 For example when we write about funky micro business ideas… we get results at Google. Yesterday six our our messages ranked in the top ten for the phrase “funky micro business ideas”. We also often deliver good Google rankings on our Ecuador real estate ads. Take for example the Puerto Lopez beach house ad shown above. Just a day after the ad was placed Google ranked the ad for the phrase “Puerto Lopez Beach House” #1, #2, and #3. 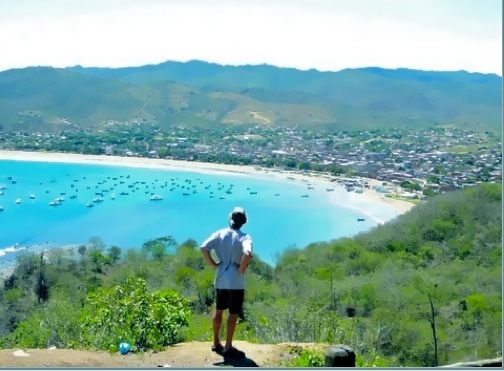 The ad also ranked at Google on the first page for the phrase “Puerto Lopez Beach”. The ad cost, including the building of the page, is $450. Place Ecuador real estate sale ads here $450.